Leghorns are a heritage breed of chicken that first came to the United States in the mid 19th century and are named after the Italian town of Livorno in Tuscany. Due to their prolific capacity to lay eggs, they became the overworked stalwart of the vast commercial egg industry. Up until most recently, due to pervasive cross-breeding and their primary use in the industrial agriculture business, they were listed on the American Livestock Breeds Conservancy (ALBC) as "Critical". However, thanks to the efforts of a few dedicated farmers to restore the breed, the remaining 'non-industrial Leghorn' chickens are raised on small farms all across the country and are now listed as "Recovering" on the ALBC. 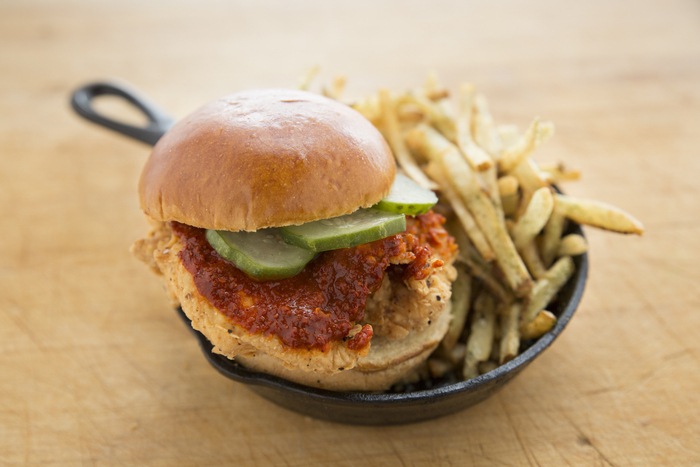 At Leghorn Chicken, we believe the small steps and passions of a few can benefit all. Are you a breast or thigh kind of gal or guy? Rooster in the hen house! Rooster in the hen house. Rooster in the hen house. There's no better way to eat fried chicken than when it's stuffed between two halves of a buttery biscuit.